On average, according to the American Red Cross, a person in America needs blood every two seconds, and every eight minutes they respond to someone in crisis. That’s a lot of blood needed from donors. This winter, the Red Cross has put out an emergency need for blood donors. In order to help out, Weber State University hosted another blood drive from Feb. 11 to Feb. 13. 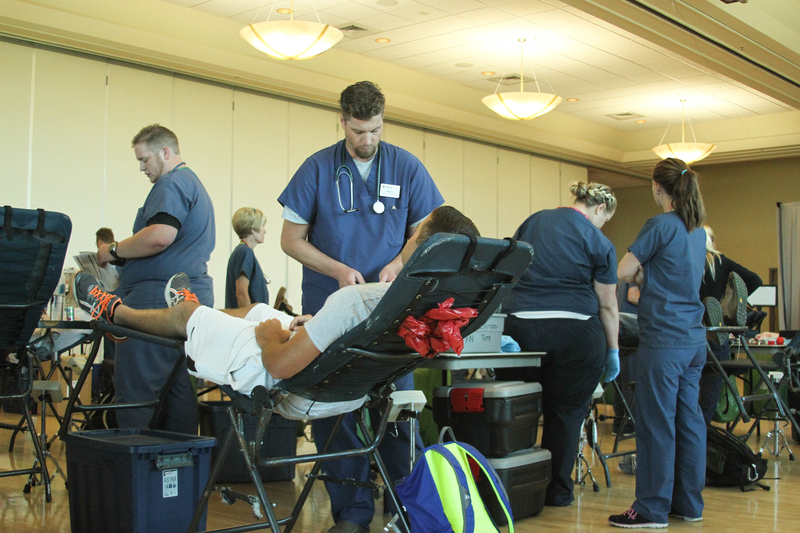 The last blood drive WSU hosted was part of a “Blood Battle” against the Utah State University Aggies. It was a bloody battle all the way to the end, but the Aggies came out on top with more donated blood than the Wildcats. The ARC and the WSUSA Service Team student chair for the organization, Rylie Howard, put together WSU’s blood drives. This year, they decided to return to a more regular blood drive in order to help with the greater need. There are some restrictions on who may donate blood, which render many people ineligible to donate. Common factors include medication, illness, low iron or weight restrictions. A restriction many are not aware of is travel outside of the United States within the last three years. The ARC notes that this puts the person at greater risk for malaria and disqualifies them. At this year’s blood drive, donors could give a Whole Blood Donation or a Power Red Donation. Whole Blood Donations require the donor to be in good health, at least 16 years old and weigh at least 110 pounds. Donors may make Whole Blood Donations every 56 days. A Power Red donation allows the donor to safely donate two units of red blood cells during one donation while returning his or her plasma and platelets using a special machine. To be eligible for Power Red Donation, the donor must be blood type O, A negative or B negative. Donors may donate every 112 days, or up to 3 times per year. Male donors under 18 may only donate 2 times per year. Male donors must be at least 17 years old, at least 5 foot 1 inch tall and weigh at least 130 pounds. Female donors must be at least 19 years old, 5 foot 5 inches tall and weigh at least 150 pounds. Donors may also donate platelets and plasma, the requirements for which are on the ARC website. If you happen to be unable to donate, the ARC can still use volunteers during drives. Finding the blood drive event on Weber Connect will provide more information. Finally, the ARC pointed donors to classes they offer. On their website, there is a variety of classes in local areas. They offer First Aid, CPR, AED, BLS/CPR for Healthcare, Babysitting and Child Care, Swimming and Water Safety, Lifeguarding, Instructor Training, CNA training, and CNA testing.